The years-overdue program was at risk of cancellation this summer when its ballooning costs triggered a Nunn-McCurdy breach. The price tag for OCX is now estimated to be around $5.5 billion — more than three times the original expected cost of $1.5 billion with all the contract options. Because of the ongoing problems the OCX program has been undergoing Deep Dive reviews every quarter since December 2015. "At each Deep Dive there has been some progress made," James told attendees at an Air Force Association breakfast held Jan. 6 just outside of Washington. "I will tell you there’s still some schedule risk — this is why I say we’re not fully out of the woods yet — but I’m confident that it’s going to be continuing to make that progress. I’m just not as confident on the time frame that’s going to be required." 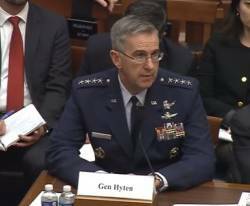 The most recent review was held Jan. 5, said Lt Gen. Arnold Bunch, the military deputy in the Office of the Assistant Secretary of the Air Force for Acquisition. "We set a 24-month schedule and we knew that was going to be a challenge," Bunch told reporters after the breakfast. "Raytheon’s still making good progress," he added. "They’re still progressing towards Block 0 and Block 1. Those are the two blocks we’re going to deliver, but we still believe there is risk to making that 24-month schedule — and we’re just monitoring progress to that." The Air Force has made changes in the program, Bunch said, altering the dynamics of how the software is being developed and modifying how the testing environment is being created. The work of the Air Force Digital Services Team, which James jokingly called the “NCST” or “Nerd Cyber SWAT team,” helped introduce some of the changes, she said. "I saw what they could do first hand." "OCX ran into some problems," James said, "in part because we had collectively underestimated the level of software complexity and the cyber security that the project would require. So we brought in these experts, many of whom came out of Silicon Valley, and they helped us understand some very advanced new software tools and techniques and practices — gave us some advice — and, in part, that helped us collectively to bring the program back on track to a better position." The Air Force is now in the process of picking new projects for its Digital Services Team to tackle. An initial project list has been compiled, Bunch said, adding that he and Darlene Costello, the principal deputy assistant secretary of the Air Force for Acquisition, are "meeting with folks to set the priorities so we that pick the right ones to put them on." He declined to say when the list would be completed. The Air Force Digital Services Team will be a component of DOD’s Digital Services, said James, a group comprising of extremely talented engineers, with skills honed in the private sector, who come into government for brief periods of time to help solve big problems. "So we’re going to now be putting this approach to work to ensure that future programs are designed with an eye to the necessary cyber requirements, and building the expertise we need to use the latest private sector techniques," she said. "So again, think of this as the new cyber SWAT team that is going to be helping us on the front end with our requirements and our contracts to make sure that we get this set up correctly going forward." Defense Digital Services will also be available, she said, to help troubleshoot other programs that, like OCX, run into difficulties. "If you ever run into this team in the Pentagon you can’t miss them," she quipped. "Of course we’re all dressed like this in the Pentagon (referring to the many uniforms in the audience). They walk around in jeans and hoodies."